Oxford English Dictionary Adds New Words, Offers Clarity On Old Ones : The Two-Way The OED unveils some modern coinage and explains a Supreme Court justice's choice of words. 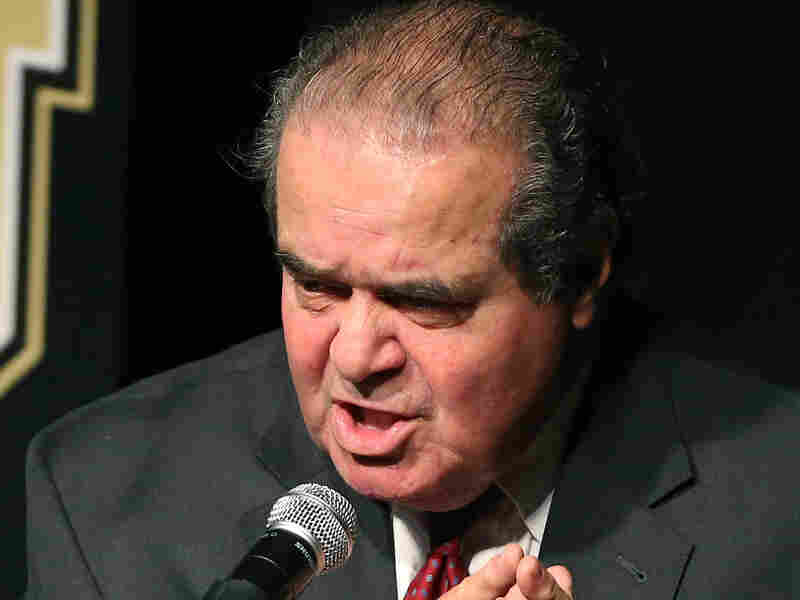 Supreme Court Justice Antonin Scalia unleashed colorful vocabulary against the court's support of Obamacare Thursday. The Oxford English Dictionary explains what he meant. Justice Antonin Scalia called on using old-time language on Thursday to express his contempt for the Supreme Court's ruling in favor of Obamacare. He called the majority opinion "jiggery pokery" and "pure applesauce." Also Thursday, the editors of the Oxford English Dictionary added 500 entries, mostly of the new-fangled variety. Maybe even more interesting for word nerds, a term widely believed to have been coined recently was found to have origins dating back to the 19th century. It turns out Miley Cyrus did not invent "twerking." The word, originally spelled "twirk" was first spotted in 1820, and is thought to be a hybrid of "twitch" and "jerk." According to the Oxford English Dictionary blog, "This is the first example of the noun found by the OED's researchers, from a letter to the author of Frankenstein, Mary Shelley: Really the Germans do allow themselves such twists & twirks of the pen, that it would puzzle any one. (1820 Charles Clairmont, Letter, 26 Feb.)"
The OED editors chose the more modern spelling, "twerk" for the dictionary entry, because, according to their blog, "while it is a later development, it is the most common spelling overall, particularly in recent use. Usage referring to the dance is most often spelled with an e, but there are some exceptions, for instance in this example from 1999: Teens at the Waggaman Playground gym gathered around the dance floor to 'twirk'. For my adult readers, I'll translate for you. Twirk is the latest dance move. (1999Times-Picayune (New Orleans) (Westwego ed.) 11 Mar., p. 3f 4/1)." Although it turns out "twerk" goes way back, many of the OED's new entries are the result of modern inventions and sensibilities, such as "photobomb," "retweet" and "vape." And while Justice Scalia's "jiggery pokery" is an old expression, on Thursday the OED used a newish medium to explain its meaning.